Creating and maintaining a blog is work, and writing and publishing are definitely not all there is to it. Once you have content online, you need to attract readers and once you have them, you need to keep them. So you need to be found in the maze of the internet. But once readers found you, the next challenge starts. Keeping and attracting them to read more is a crucial factor for a blog to be successful. But increasing these page views and reducing the bounce rate is a big challenge for site owners. So it is helpful to give readers a direct hint of more content with a topic they are already showing interest in. One way to do it, is to link to your other posts and content inside your article. So while reading, your visitors are already seduced to open more. Of course that is easier said then done. The thing is, we don’t always want to think about related content ourselves and include every single link. Also, as content grows there can be new and even better relationships. Showing related posts are a proven concept to always display links to other related articles, without having to think of them yourselves. And of course with WordPress, you can use a plugin to help you. To suggest links to related content of a website, the content of this one post has to be compared the content of all other posts of your site. The more content your site has, there more there is to do – either for you or for the plugin. For a machine, this means that a heavy query needs to run through the database. As the WordPress database is not fully optimized for these kind of queries, the operation is costly. It needs a lot of computing power, which may slow down your site. One feature of WordPress sites is, that they reload and recreate each page on each load. That also means, that the related posts query runs with every single page view. And as it is a heavy query, it means a lot of calculating for the server. If you have a lot of content, it can slow down your site and the whole server at one point. Therefore, hosting providers are often not a fan of related posts plugins and some won’t let you use every option out there. The Related Posts for WordPress Plugin not only focuses on finding the best links, it also has a strong interest in site performance. It’s faster and it doesn’t slow down your website. To achieve this, two principles are being used. First, by caching the related posts results. That means, a copy of what other content is related is stored with each post. The query doesn’t run every single time and your blog will perform much better. Second, the heavy query doesn’t run in the front-end when visitors load the page. Instead, it runs in the admin panel to keep the page load itself fast. While all these post relations are cached and stored, you can be sure that your content is yours only. 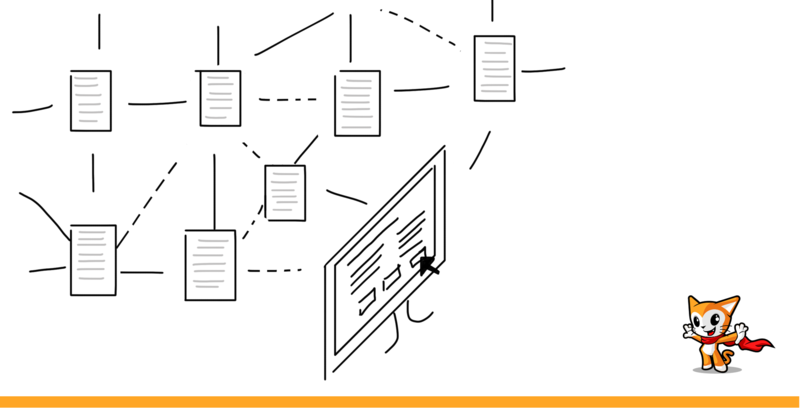 Related Posts for WordPress will parse, cache and serve the content from your own server. That means, that there are neither additional external requests when loading an article nor is you data stored with any third party. Using a new plugin for your related posts means, that there is a new algorithm and a new way the posts are connected. So it doesn’t matter, if you used a different plugin before or if you start with Related Posts for WordPress – you have to set up your new plugin one time to get the most out of it. The main reason you want the plugin is to link posts to each other. So this is also what Related Posts for WordPress starts with. You will enter an installation wizard which will analyze your posts and link them according to their relation. If you want to know more about how relation is determined, you can read about it here. So after installation the plugin will analyze all (maybe thousands) of posts you have in your blog and relate them to each other, without any manual work by you. Not every relation the plugin determines might be exactly what you wanted to show. Sometimes, there a posts where you want to show specific other posts to read along with. Sometimes, mistakes are made in the relationships. No matter what the reason, you can change the displayed related posts an a per post basis. You go to the edit screen of the post you aren’t satisfied with, look for the Related Posts box and select the posts you want to see there by unlinking or adding certain other posts. Even though there are pre-set options in all the settings, you should always take a look through them. You can define yourself, how many posts are displayed, if new posts get linked automatically, what the headline should say and how many words the displayed excerpts will show. Finally, you should show the posts to your visitors. There are 3 ways you can display the related posts in your blog. The probably most common way is right underneath the post content. Most themes already have a hook right there, so the plugin will fill its contents in there. If you want to show similar posts in your sidebar, you can use a the related post widget, which will come with the plugin. Last but not least, if none of these are the right options for you, you can decide yourself where to show them by including the shortcode [rp4wp] at any position within your content. If you acquired the Premium Version, there are more things you can change and add. The most noticeable advantage is that you can not only link posts to each other, but you can use the plugin to relate any kind of post type. No matter if blog posts, pages, products, custom post types, etc. And you can decide yourself, what you want to link them to. So you can use your blog posts and relate them to products, you sell. Or you can use your portfolio items and relate them to posts and pages with similar content or additional information. It’s up totally up to you, how you want to lead your customers through your website. 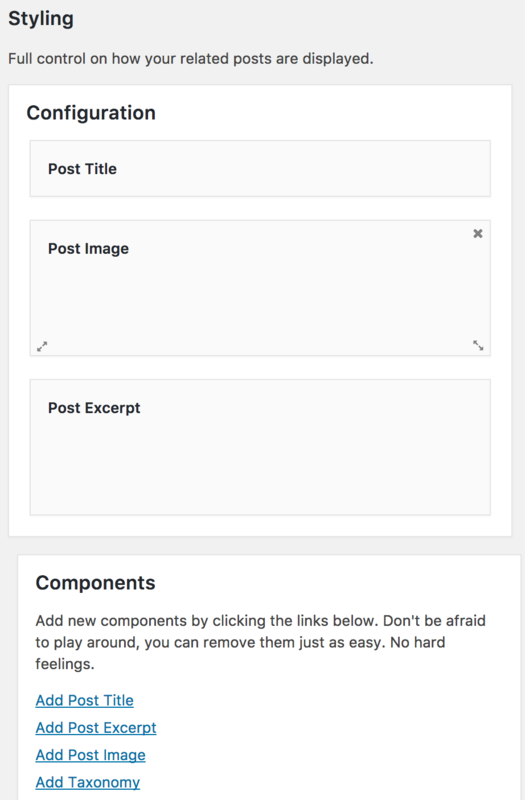 Once you have the fitting related posts connected with each other, you might want to change the look and feel of it – so it fits better to your theme or so it displays more or less content, etc. You can also change the headline of the Related Posts depending on the Post Type. 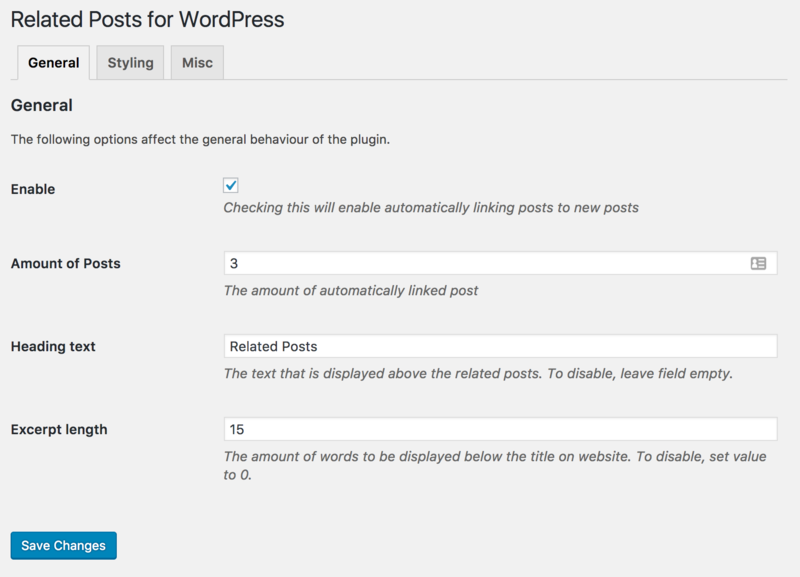 Related Posts for WordPress Premium comes with it’s own Styling settings tab, where you can adjust what the Related Posts part displays and how it looks. For example, you can add or remove the excerpt, show taxonomies or the author or add some custom text. You don’t need to know any code for it, you have a simple drag and drop display to arrange and size the different items. The post relation is determined by multiple factors. Some are more important, some less. 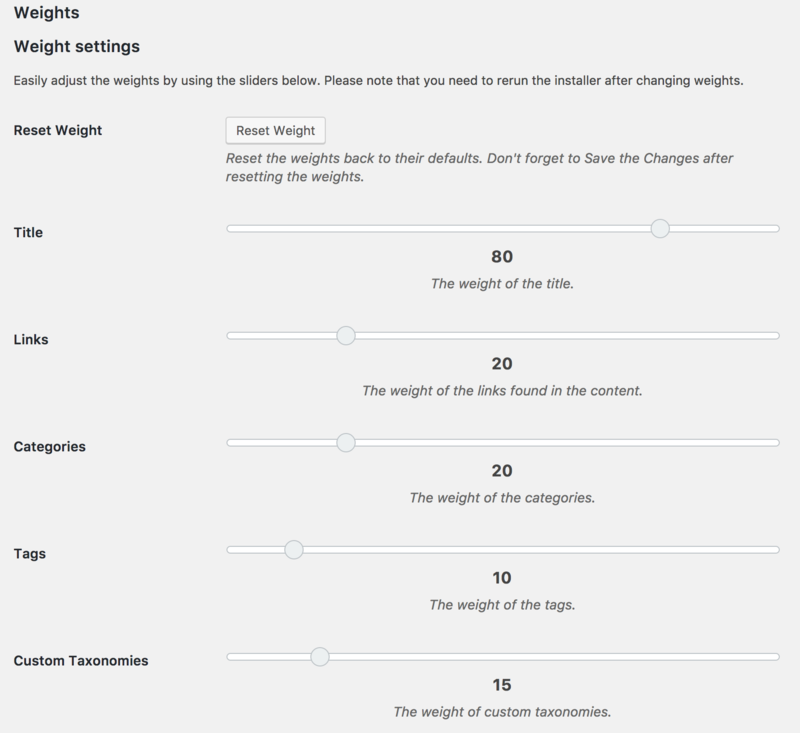 If you are not satisfied with the created relations, you can go into the Weights tab in the Related Posts settings and change the importance of the different factors. Or you might have a blog which is using specific words too often to use them as a link basis. So you can go to words and decide which ones should be ignored. And the other way around you define which words should build a relationship, even though the algorithms doesn’t recognize them as similar. Therefore, you can customize the experience to your needs even better. 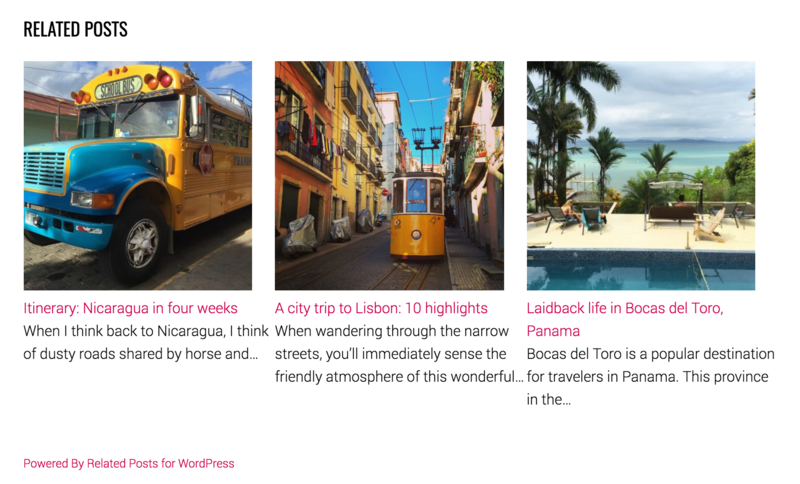 With Related Posts for WordPress, you can create easily accessible routes for your readers through your website, show them the content, they might be interested in and keep them with you. At the same time, you don’t have to cut down on the sites performance. Instead, you can decide in the backend if the posts fit or not and how they are supposed to be displayed. This will result overall in more page views, longer visitor duration and reduced bounce rates. And when viewing more of your articles, visitors can also appreciate all your work and your website even more. Which might then result in subscriptions, social shares and even conversions. So go for it! Thanks for sharing your great knowledge. I really appreciate it.